A portrayal of the daily life of real people in the world of Jesus and his time This book portrays the cultural, economic and religious life of real people in the real world of Jesus and his time. Palestine was not a backwater, but a highly cultivated part of the Roman empire with theatre, literature, postal services, library systems and commerce. The author presents an entirely different picture to the popular conception of a provincial world in the back of beyond to give us a better understanding of the context from which the message of Jesus was spread. 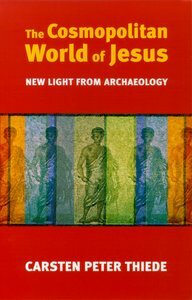 About "The Cosmopolitan World of Jesus"
Until his death in December 2004, Carsten Theide was Professor of New Testament History and Papyrology at The State Independent Theological College (STH Basle), and taught at the Department of International Studies at the Ben-Gurion University of the Negev, Beer-Sheva, Israel. His book, The Jesus Papyrus, co-written with Matthew d'Ancona, was a major bestseller. Born in 1952, Thiede held academic posts at the universities of Berlin, Geneva and Oxford. He is a member of the International Papyrologists' Association and a board member of the History Department at Ben-Gurion University of the Negev, Beer-Sheva, Israel. His wife is English and they have three children. He was ordained an Anglican priest in November 1999.